Be a Part of the $20,000,000 Jewelry Give-away! Every one of our Jewelers is in the business of giving FREE jewelry! That’s right. It is amazing that you can actually earn money through Premier Designs when it’s all about giving. We have the best Hostess benefits – 30% of the Home Show retail in FREE jewelry plus up to an additional $100 in FREE through our bonus program. Let’s be a part of something truly amazing and give away more FREE jewelry this Christmas season than has ever been given away before. 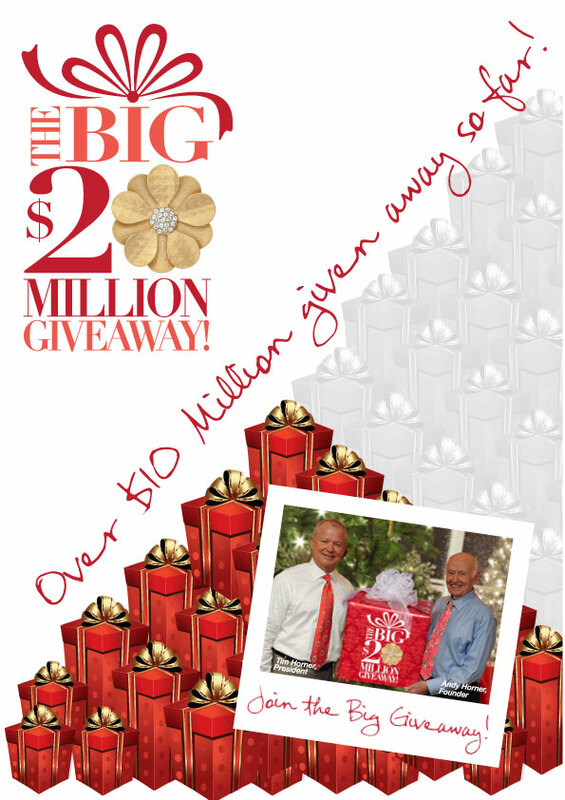 Let’s work together to give away $20,000,000 in FREE jewelry from October 29th through December 16th. That’s seven weeks to give away TWENTY MILLION DOLLARS in FREE jewelry. Every week you can track the progress of this wonderful give away through our social connections. We will let you know each Tuesday the total amount of FREE jewelry all of you gave away in the previous week. On Wednesdays we will recognize the 100 Jewelers who gave away the most FREE jewelry the week before. Then on Thursdays, check back with us because we will celebrate with the top 20 Jewelers who have given away the most FREE jewelry since October 29th and wait anxiously to see who gives away the most! In fact, the 3 Jewelers who give away the most FREE jewelry after those seven weeks will receive the new Spring and Summer Collection for FREE at our January Regional Rallies. Those who represent the rest of our top 10 GIVERS will each receive a half line of the new Spring and Summer Collection. This is going to be an amazing Christmas season! Are you excited about being a part of the biggest give away of jewelry in Premier history? Premier Designs – How do I love thee? A LOT!!!!! SWEET! I LOVE giving away jewelry! Thanks so much for all you do for us jewelers! Premier NEVER ceases to amaze me! I love my company!!!! It’s an honor to represent a company who always has your back, who is always looking for new ways to enrich people’s lives all over the world. I love this company!! Truly amazing to be a part of it! Thank you!!! I am really excited to bring my hostesses and guests to our new website and FB fan page. This is an amazing resource that will be an great tool in our future business. Thank you so much. Love, love, love Premier! Premier never ceases to amaze me with the ways they support us in the field! And we can be rewarded for what we love to do – give, give, give back to our customers & hostesses who keep us in business! WOW – what an awesome company I get to represent! I love Premier! I LOVE PREMIER!! It just gets better and better-I just love that Premier is a Company that serves People. So glad that for 16 yrs I have been a part of this AWESOME Company. Looking forward to SERVING YOU and enriching lives. Thank You Premier for being a Company of Honesty and Integrity. Now I can give away some more FREE JEWELRY!!!! BEAUTIFUL!!! Well done Premier, Thank you! I am so excited to have something to show my hostess’s and customers. They have been asking for such a long time for something. Very excited! Premier has come a long way in my 16 years of being jeweler. I agree…. This is absolutely AMAZING!!! Premier never ceases to amaze me! Sooo impressive. I’m so excited I can’t stand it. Thank you to everyone at home office… for EVERYTHING! How Do We Love Thee….In All Ways Imaginable, you are a fantasic company and I Love You!!! I am so excited with this step into our future. I knew that Premier Leadership would find a way to effectively marry the purpose, philosophy and objectives of Premier and the reality of social media. Buckle Up and Hold on to your Earrings and be prepared to take service to a whole ‘nother level! Can’t wait to give away jewelry at my show this Friday. Thank you Premiere for all that you do. This is amazing! Thank you Premier! The BEST company out there and I am so blessed to be part of it! Love the FB page, the blog, all of it! Thank you, thank you, Premier! No wonder I joined such a terrific and caring company. You take such good care of us. Does this mean they are extending the $75 get a free $40 item promotion thru December 16th ?? The GWP ended on the 23rd but our great hostess benefits continue to be offered. 30% in FREE jewelry and four bonuses to earn up to an additional $100 in FREE jewelry. We are continuing to count the FREE jewelry given through our Hostess benefits up until December 16th. WOW never thought we would see the day, but here it is. A little overwhelmed but very pleased. Premier Design’s is truly the BEST company I have ever been with! Blessings to all and GIVEAWAY more bling this holiday season! This is AMAZING!!! I am so excited and honored to be a part of this company. It’s been almost 6 years and I am still in love with Premier! ❤ It is truely the best direct selling company out there! I LOVE this!!! This is a great way to communicate! and I love the contest!! I love love love this business. Thank you Premier family for always looking out for your jewelers AND the hostesses that serve with love from Him! Just when you think that Premier Designs couldn’t possibly be more generous than they already are, they just keep on giving!! I love this company and I’m so happy and blessed to be with this amazing Premier family!! Wow!!! This promotion as a whole is amazing! I am soo proud to be a part of an amazing company!!! WOW!!! I LOVE EVERYTHING!!! I am so proud to be a jeweler of Premier Design! Way to go Premier! I like this Premier Jewelry !! It is very nice !! This is incredible! My hostess yesterday exclaimed, “I am so excited to play in all my new jewelry!” She has been a Chico’s client for many years and is just now getting a taste of Premier. Premier is the gift that keeps those compliments coming, season after season! WOW!!! What a true blessing! Let’s Rock to the Top and Give it Away! Premier is not “just” a company. It is an adventure, an opportunity to not “just” earn family income but to meet amazing folks both in the busines and in your ever expanding group of customer/freinds and fans of Premier! What an AMAZING BLESSING to be part of a company of such integrity, who Honors God and sets the standard in “serving others and enriching every life we touch”! I am so blessed by all my wonderful Hostesses and fellow Jewelers! Thank you! I love saying I have the best job in America, with the best company in America… and being able to give that opportunity away to anyone else! This is awesome! What a great company to work for! Is the Gift With Purchase Promotion getting extended to Dec. 16th? Oh, no, Jolie, not a gift with purchase. Please be sure to reach the details – this is just a new focus area. Thank you for asking! You all did an amazing job on this. Thank you for all you do for us and our lovely hostesses! Premier never ceases to AMAZE me and everyone in this great company!!! We are here to serve!!!! I Love Premier!!!! Premier said a year ago they would find the best way to enter the social media arena — I’m so glad they waited and did it SO WELL!! I love it all– and am telling all my hostesses, clients, and friends about it all! I’ve only been with Premier for two years, but it’s been amazing and I look forward to continuing and building more awesome relationships. It just keeps getting better! Thank you, Premier! Is the 75-40 special getting extended throughout this giveaway? Someone posted that it was, but I don’t want to give out any false information. Please read the details of the Big Giveaway carefully. It’s not an extension – it’s just an additional focus. So far this month I have given away $1300 in FREE jewelry!! WOOOOOHOOOOO! Wow! I am still in awe that I am part of such an amazing company!! I’m on my way to give away the most ever to my wonderful hostesses!